7 Colour / Bulb Glass Not Required - £28.00 GBP 7 Colour / INCLUDE Bulb Glass - £32.00 GBP Black / Bulb Glass Not Required - Coming Soon! Black / INCLUDE Bulb Glass - Coming Soon! Black with White Spray / Bulb Glass Not Required - Coming Soon! Black with White Spray / INCLUDE Bulb Glass - Coming Soon! Gold / Bulb Glass Not Required - £28.00 GBP Gold / INCLUDE Bulb Glass - £32.00 GBP Gunmetal / Bulb Glass Not Required - £28.00 GBP Gunmetal / INCLUDE Bulb Glass - £32.00 GBP Matte Black / Bulb Glass Not Required - £28.00 GBP Matte Black / INCLUDE Bulb Glass - £32.00 GBP Navy Blue / Bulb Glass Not Required - Coming Soon! Navy Blue / INCLUDE Bulb Glass - Coming Soon! Red / Bulb Glass Not Required - £28.00 GBP Red / INCLUDE Bulb Glass - £32.00 GBP Red Camo / Bulb Glass Not Required - £28.00 GBP Red Camo / INCLUDE Bulb Glass - £32.00 GBP Stainless / Bulb Glass Not Required - Coming Soon! Stainless / INCLUDE Bulb Glass - Coming Soon! TFV12 Prince also has a newly designed crown style body and colourful Cobra resin drip tip. 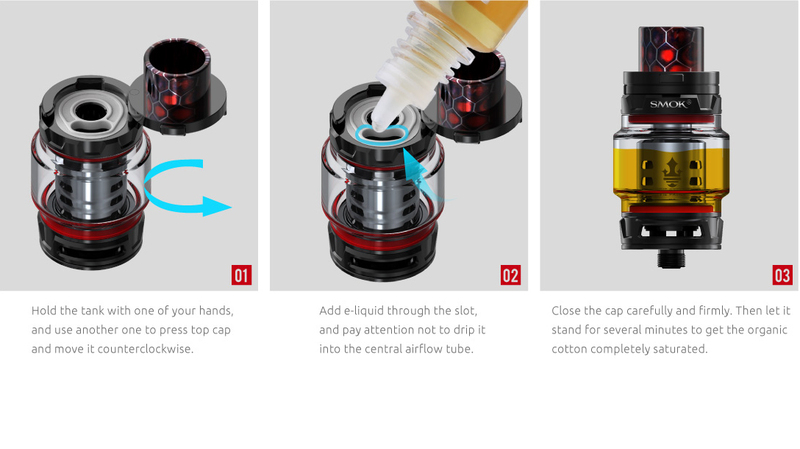 It also uses a convex glass tube, which effectively enlarges the capacity to 8ml! SMOK Strip coil is a revolutionary new coil from SMOK, made from kanthal. SMOK has innovatively developed a heating membrane unit with a porous structure which brings greater surface adsorption. This increases the speed of e-juice absorption. It has larger heating area, making the burn more even and helping the e-liquid to heat up quicker. Compared with other traditional heating wires, the strip coil can handle higher power levels. Compared to the traditional coil, TFV12 Prince mesh coil has a much wider heating area, which can heat more evenly and absorb e-liquid far more effectively. All of this makes for a better flavour and huge vapour production. What's more, the mesh coil has a longer life span! 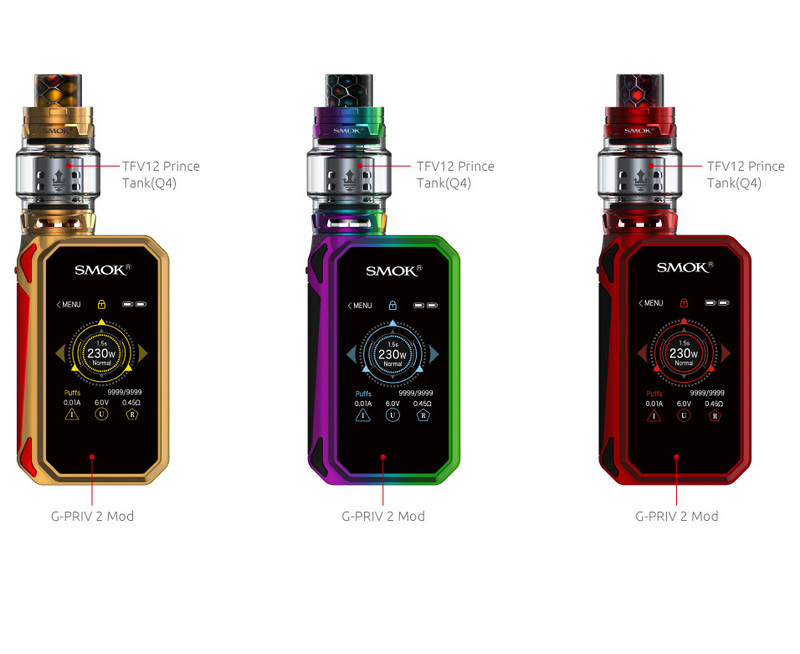 Different from traditional tanks, TFV12 Prince adopts convex glass tube (Bulb style Pyrex Glass Tube #2), which can effectively enlarge the Eliquid capacity . Supplied with standard 2ml glass. Fantastic device and some very good coils that give the best vaping experience I’ve had so far. I can't believe how much flavour I'm getting compared to all my other tanks. I'm using the pre-installed coil at 60watts. The only downside with this tank is having to dismantle the whole thing to change coils but I'll happily live with that inconvenience on flavour alone. Can't wait to try out the 8 and 10 coils supplies in the package. Excellent tank - big clouds and did I mention the flavour! I can't believe how much flavour I'm getting compared to all my other tanks. I'm using the pre-installed coil at 60watts. The only downside with this tank is having to dismantle the whole thing to change coils but I'll happily live with that inconvenience on flavour alone. Can't wait to try out the 8 and 10 coils supplies in the package. Excellent tank - big clouds and did I mention the flavour?! 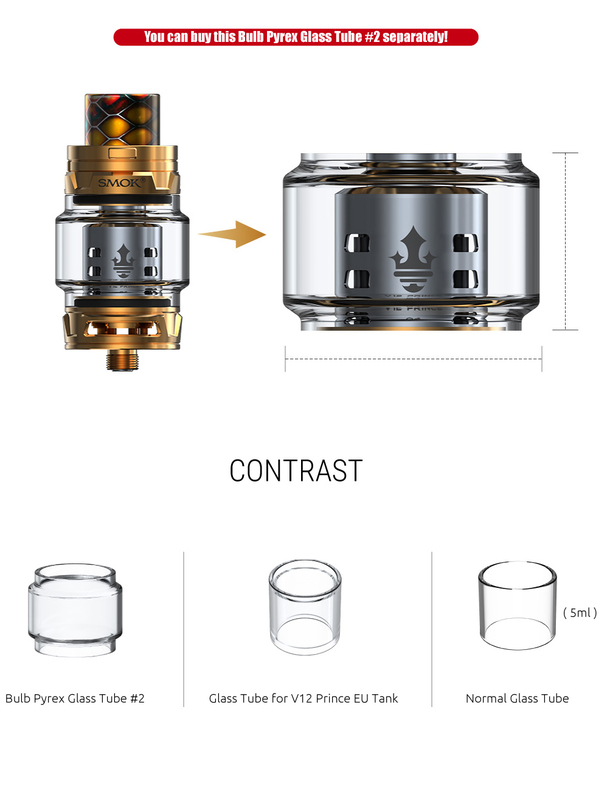 The prince tank is machined to a high standard,and has very soft edges, performance is excellent and no leaks, consider buying replacement 8ml glass bulb with your order its a much better capacity to have. yes would certainly recommend this tank.